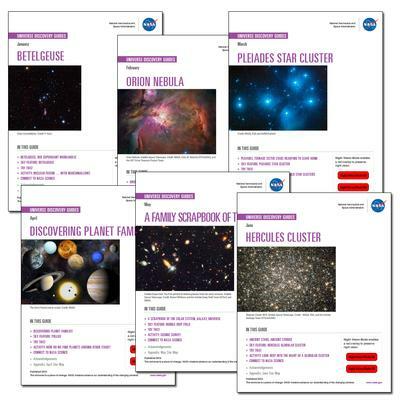 Discover the Universe Guides now available! Discover the universe with your family and friends! Each Guide can be viewed on a computer in full color. You can also download a special "Red" edition of each Guide which features a red overlay to preserve your night vision. Always use Adobe Acrobat Reader to view the Guides on a computer. There is one guide for each month! Please see our index below and click on the names of the months in order to view each resource page. You can also find them by clicking on "Astronomy Activities" link as well. Activity: How Do We Find Planets Around Other Stars? Theme: Are We Alone in the Universe? Activity: What's the "Habitable Zone" Around a Star? Theme: Are All Planet Families Like Ours? Theme: What is the Fate of the Universe?